Should looters go to jail? BIBLE HISTORY DAILY: First Person: Should These Looters Go to Jail? As published in the July/August 2017 Biblical Archaeology Review (Hershel Shanks). Much of this essay is about an imaginary looter and a (regrettably) imaginary inscription. But the question in the headline is about some real looters. More on their story is here. And more on Operation Scroll is here and links. I leave it to you readers to decide on your own answer to the question. APOCRYPHICITY BLOG: 2017 ISBL Preview: “‘Arabic’ Infancy Gospel No More” (Tony Burke). This text presents some methodological challenges that are not untypical for Christian Apocrypha. The 2017 ISBL is taking place on 7-11 August. I am not attending this year. I hope everyone has fun. Please post reports! THE ASOR BLOG: Rescuing Syriac Manuscripts in Iraq (Amir Harrak). I followed the story of ISIS capturing the Mar Behnam Monastery in 2014, its liberation in 2016, and the recovery of its manuscripts after the liberation. See here, here, here, here, here, and here. Cross-file under Syriac Watch. ANCIENT JEW REVIEW: Website Construction as Introduction to Academic Research (Rebecca Falcasantos). For the past three semesters, students in my introductory Bible course have created websites as a way of learning the basic methods of academic research, analysis, and argumentation. Is Hobby Lobby being held to a double standard? RELIGION NEWS SERVICE: Despite smuggled antiquities purchase, some say criticism of Bible museum is unfair (Menachem Wecker). Some prominent scholars are pointing out that Hobby Lobby's antiquities-acquisition misadventure is hardly unique in the museum world. And they are wondering if a double standard is being applied because of hostility to the Green family's evangelical Christianity. But others disagree. Read the article and see what you think. HT Jim West. For background on Hobby Lobby's recent settlement with the U.S. Justice Department over improperly acquired antiquities, see here and links. And follow the links there for past posts on the Green Collection and the soon-to-open Museum of the Bible. JOB OPENING AT UCLA: Assistant Professor in Early Judaism. Eligible applicants will have a Ph.D. or equivalent in hand by June, 2018. The application deadline is 15 October 2017. Follow the link for further particulars and application information. To mark seventy years since the initial discovery of the Dead Sea Scrolls, an international symposium will be held in Jerusalem, April 29–May 3, 2018. The overarching symposium theme will be “The Wilderness”—as a real place; as the location of biblical episodes, most notably during the formative years of Israel's wandering from Egypt to the Promised Land; as a motif; and as a concept (sometimes idealized, sometimes demonized). The wilderness figures prominently in biblical texts and in the literature of the Second Temple, rabbinic, early Christian, and early Islamic periods. It was also a place of habitation by various groups during these periods, which have left us archaeological sites, artefacts, documents and the more than 1500 Dead Sea Scrolls. 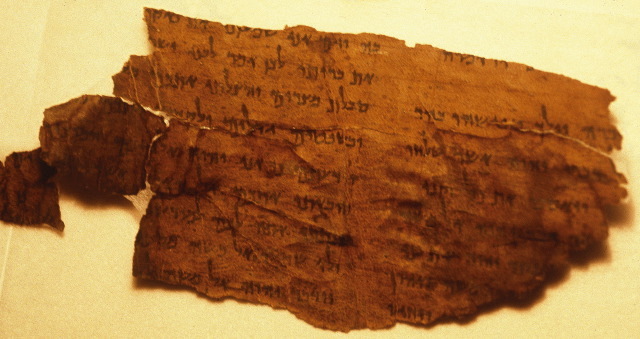 Conference papers may address any aspect of the wilderness as it relates to Qumran; other Judean Desert sites; the Dead Sea Scrolls; and the associated late antique literatures, cultures and religions—particularly, Judaism, Christianity, and Islam. Papers may focus on such topics as the reception of biblical figures (e.g., Moses, Aaron, Phineas, Miriam, Balaam), events (e.g., the giving of the law, the sin of the golden calf, the building of the tabernacle, covenant ceremonies), and themes (e.g., revelation, law, covenant, rebellion against God, sanctuary, water, and manna) connected with Israel’s time in the wilderness; relevant textual and philological analyses; the use of the relevant biblical passages in shaping later texts; the influence of the desert climate, flora, and fauna on the ancient texts and their state of preservation. The conference will feature invited lectures; open sessions; and two public lectures. Papers will be accepted for the open sessions in accordance with the relevance of the topic to the overall program. Please send a proposal of no more than 250 words to the Orion Center email address (orioncenter@mail.huji.ac.il). Deadline for receipt of proposals is September 20, 2017; responses will be mailed by October 31. Adolfo D. Roitman, Lizbeth and George Krupp Curator of the Dead Sea Scrolls and Head of The Shrine of the Book, The Israel Museum, Jerusalem. We are grateful to the organizing bodies, as well as the Austrian Federal Ministry for Europe, Integration, and Foreign Affairs, for their sponsorship of symposium expenses. THE BIBLE PLACES BLOG: Survey Results: Favorite Vista (Todd Bolen). My vote was for the Mount of Olives, which came in at second place. THE CENTRE FOR THE STUDY OF THE JORDANIAN LEAD BOOKS has published its comprehensive report on the metal codices, by Samuel Zinner, on its website. You can download the pdf file here: Son of the Star: Bar Kokhba and the Jordanian lead books. It's a big file, so be patient with the download. In this report, Samuel Zinner examines the controversial ‘Jordan codices,’ addressing the complex ethical and legal issues involved in undocumented, non-provenanced artefacts. There is much to be wary of in enthusiasts’ and naysayers’ claims, both of whom fall prey to emotionalism. Aligning his position with that of André Lemaire, Zinner cautiously leaves open the possibilities of ancient authenticity (for a core group) and an elaborate pre-modern fake, carefully weighing the evidence for each. Zinner demonstrates that at least some of the artefacts are modern copies of older exemplars. If ancient, the Jordanian artefacts are apotropaic grave objects designed to afford protection to the deceased and information relevant for their afterlife. Their contents would date from the immediate post-Bar Kokhba period to the time of Julia Domna and beyond (ca. 136-217 CE). Ancient or modern, the artefacts’ contents retrospectively view Jewish history from the Maccabees to Bar Kokhba principally through the prism of the latter’s revolt and its demise. The artefacts’ main inspirations were ancient Jewish and Greco-Roman coinage, which naturally suggested to their creators the choice of a metal medium. The sheet format was dictated by apotropaic grave precedents such as Orphic tablets. With some exceptions, each Jordanian ‘book’ consists of a large image-text design that has been arbitrarily cut down to smaller-sized individual sheets subsequently bound together in order to retain the separate leaves’ association. ‘Book’/‘codex’ is not the most fitting terminology for these artefacts. The closest comparative parallels are the Martin Schøyen/Würzburg ancient Greek alphabet copper plaques, the Orphic lamellae, the Gnostic lead book in the National Museum at Rome, and the Mandaeans' lead books. Samuel Zinner studied ancient and modern languages, literatures, and histories, and museum and archival studies at the University of Nebraska-Lincoln where he received his PhD in 2002. His coursework included intensive studies in Shem-Tob’s Hebrew Matthew gospel and in ancient Jewish, Christian and Greco-Roman texts. Other areas of concentration included modern German and Russian literatures, poetics, linguistics, philology, and cryptography. His training in modern European history involved research in Holocaust and genocide studies, ethnic cleansing, and indigenous issues. He is author of several monographs and essays that have appeared in English, German, and Russian. It is lengthy: over 1100 pages, although that includes many images. It addresses the issues that need to be addresed and does so thoughtfully and in great detail. Rather than coming to a final conclusion, Dr. Zinner explores the evidence for what he understands to be the full range of possibilities. I have read the (long!) introductory sections and the conclusion and have read and skimmed some of the core chapters. That took up most of a day of my vacation. I'm not ready to comment yet, but I will post some comments once I have time to look at it a little more and to digest the material. I should also note that the Lead Book Centre has published a number of films on the codices. I will respect their wish that the videos not be embedded, but you can go to their YouTube site here to view them. Background here and many, many links. Cross-file under Fake Metal Codices Watch. I acknowledge that various elements of the current discussion may point to some of the codices being something other than fake, but I remain to be convinced. I will have more to say in due course. In any case, I continue to include this cross-file rubric so that readers can search it to find all my posts on the subject. NEO-PUNIC WATCH: Buried at the Racetracks: 1,500-year-old Grave Discovered at Carthage Circus. The ancient Carthaginians were so obsessed with gambling that some may have chosen the races as their final resting place, archaeologists suspect (Phillippe Bohstrom, Haaretz). You can't take it with you, but you can try to stay. The article includes some information on curse tablets (intended to influence the races) and on ancient gambling. It also reports on some older, Punic, remains found at the site. I noted another story on the archaeology of the Carthage Circus here. RENOVATION: Travel back in time at this secret cool oasis in Jerusalem’s Old City. The first stage of the 100-year-old Terra Sancta Museum’s reboot offers a multi-media tour of the holy city from a Christian perspective (Amanda Borschel-Dan, Times of Israel). Moving lithely in his brown Franciscan monk’s habit and sandals, Father Eugenio Alliata stoops next to a newly discovered Second Temple period flagstone to pick up a mosaic piece overlooked by the Israel Antiquities Authority crew that morning. Such finds, he confirms, are a typical byproduct of the ongoing expansion and renovation of the Terra Sancta Museum in Jerusalem’s Old City. Located on the second station of the Via Dolorosa — the 14-station path Jesus walked from sentencing to crucifixion — the museum is housed in the lush Flagellation Monastery compound. Archaeological finds are sprinkled among the chapels and well-kept gardens that form an oasis away from the cramped hustle and bustle of the narrow street beyond its gates. Alliata, the 70-something scientific director of the museum and a professor at the Studium Biblicum Franciscanum, exhibits a curious combination of old school archaeologist — he enthusiastically points out a recently discovered Byzantine cistern and Crusader period tunnels forgotten by time — and an eagerness to adapt modern technology to enhance the museum’s vast collection’s records and display. Implementing his vision is the museum’s reboot project director, Sara Cibin, who is on extended loan from the government in her native Italy. The displays include a section of Jerusalem's bedrock. The museum's collection of artifacts from ancient Palmyra is currently on display in Italy. READING ACTS: What is the Book of Jubilees? Phil Long continues his blog series on the Old Testament Pseudepigrapha. He also dealt with Jubilees in an earlier post, noted here. The Jubilees Palimpsest Project is currently working on recovering more of the Latin translation of Jubilees. See here and links. Other past posts in Phil's Pseudepigrapha series are noted here and links. Cross-file under Old Testament Pseudepigrapha Watch. In a conversation with The Times of Israel, Eitan Klein, deputy director of the IAA’s Unit for the Prevention of Antiquities Looting, said the case is significant in that it highlights the fraudulent use of Israeli law in the dealing of artifacts looted across the Middle East. As Israel is the only country in the region that legally allows antiquities commerce, dealers of looted antiquities and smugglers from neighboring countries make use of the Jewish state as a clearance point for resale in order to give their wares a veneer of legitimacy. “In all other countries — Jordan, Lebanon, Iran, Saudi Arabia, Turkey, Iraq — it is illegal to deal antiquities. The problem is that the dealers that we gave permission to deal antiquities are using our law to deal in looted artifacts,” said Klein. The position of the IAA is that antiquities sales should be forbidden in Israel, said Klein, and it is in exploratory talks with the Justice Ministry to investigate legal options after twice failing in the Knesset to amend the existing law. I thought that this week we would solicit your perspective on the best vista on your itinerary. The site can be in Israel or any other biblical land. My experience of vistas in biblical lands is less comprehensive than I wish, but I did submit a good one. As usual, I will link to the results when they come out. THE LATEST: An exciting conversation with Rabbi Steinsaltz. President Rivlin calls Rabbi Adin Steinsaltz on prolific scholar's birthday, wishes him continued health and many more years of teaching (Arutz Sheva). President Reuven Rivlin called Rabbi Adin Even-Israel Steinsaltz Sunday to congratulate the rabbi and wish him good health on his 80th birthday. Rabbi Steinsaltz is considered one of the great rabbinical commentators and scholars of this generation, and has written numerous world-renowned commentaries on the Bible, the Talmud, and many other religious Jewish texts. Rabbi Steinsaltz suffered a stroke six months ago. It is good to hear that Rabbi Steinsaltz is back at work. I wish him good health and a full recovery. Background here and links. For further background on Rabbi Steinsaltz and his work, especially his Hebrew and English translations of the Talmud, keep following those links. PUNIC WATCH: Today, in the Boston Globe's This day in history. In 216 B.C., during the Second Punic War, Carthaginian forces led by Hannibal defeated the Roman army in the Battle of Cannae. Past posts involving the Battle of Cannae are here and here, and links. You can find the whole story there. Every so often I also like to link to this post, which explains why PaleoJudaica pays attention to the Phoenicians, Phoenician, the Carthaginians, and Punic and Neo-Punic. Antiquities dealers arrested in connection with Hobby Lobby? THIS IS GETTING COMPLICATED: Israeli Authorities Arrest Antiquities Dealers In Connection With Hobby Lobby Scandal (Daniel Estrin, NPR). But later in the day, in a court hearing, Israeli police said the arrested Jerusalem antiquities dealers are suspected of tax evasion for failing to report the $20 million in earnings to Israel's tax authority — and are also suspected of money laundering for an alleged scheme in which fictitious receipts and invoices were issued for antiquities sold to [Hobby Lobby president Steve] Green. Background on the recent arrests in Jerusalem is here. Background on the recent Hobby Lobby settlement with the U.S. Justice Department is here and links. REMNANT OF GIANTS: Is Og with the Quick or the Dead? New article from Laura Quick. “Laying Og to Rest: Deuteronomy 3 and the Making of a Myth,” Biblica 98:2 (2017): 161–172. Deane Galbraith has a detailed response to the article. He's not convinced. Past PaleoJudaica posts on Og the Giant are here, here, here, here, here, here, here, here, and here. THE TELL ES-SAFI/GATH ARCHAEOLOGICAL PROJECT BLOG: INSCRIPTION!!! That's right. A new inscription was discovered Gath last month. So far details are scarce. This post does say that "it is quite similar, in its general characteristics, to the “ALWT/WLT” inscription that we published about a decade ago." There is a link that I can't get to work. But I did have a post about that inscription when it was found back in 2005. There was a mixup at first that led the media to conclude that it bore the name of the biblical giant "Goliath," who was from Gath. But it actually had two names that are structurally similar to Goliath, but which are not that exact name. Deane Galbraith gives a chronicle of the misunderstanding here. Beyond that, we are told that the new one is a nice little inscription and another post refers to the very interesting inscription found in that area. I will keep an eye out for more news. BIBLIOGRAPHIA IRANICA: Household and Family Religion in Persian-Period Judah. Notice of a new book: Gallarreta, Jose E. Balcells. 2017. Household and Family Religion in Persian-Period Judah: An Archaeological Approach (Ancient Near East Monographs 18), SBL Press. Follow the link for ordering information and a description. A couple of recent PaleoJudaica posts involving the Ninth of Av are here and here. See also Lawrence Schiffman's recent post, When the Talmud Was Burned. CONGRATULATIONS TO THE NEW MEMBERS OF THE AMERICAN ACADEMY OF ARTS AND SCIENCES! I learned about this year's round when I received an announcement from the Orion Center that Professor Emeritus Emanuel Tov of the Hebrew University had been elected. Professor Tov is one of the world's foremost experts on the Dead Sea Scrolls. When I looked at this years list of newly elected members, I saw that Peter Schäfer, Professor Emeritus at Princeton University and current Director of the Jewish Museum Berlin, has also been elected. Professor Schäfer has vast accomplishments in the field of Jewish studies. I am best acquainted with his foundational work on the Hekhalot literature, the texts of pre-Kabbalistic Jewish mysticism. In addition, Professor Carl R. Holladay of Emory University has been elected. Again, his accomplishments are wide-ranging. I am best acquainted with his important multivolume commentary on the fragments of Hellenistic Jewish authors. I am delighted to congratulate all three (and anyone else in the field whom I may have missed) on this outstanding achievement. APPREHENDED: POLICE ARREST 5 IN $20 MILLION BLACK MARKET ANTIQUITIES, TAX FRAUD STING. Rare antiquities, NIS 800,000 in cash, and luxury cars were seized from east Jerusalem suspects’ homes and businesses (Daniel K. Eisenbud, Jerusalem Post). Following a protracted international joint undercover investigation, police on Sunday arrested five east Jerusalem antiquities dealers accused of a $20 million tax-fraud and artifacts scheme reaching as far as America. According to police, the investigation was launched several months ago with US law-enforcement agencies, the Antiquities Authority and Israel Tax Authority after evidence surfaced that the dealers were involved in illegal transactions for seven years. “The antiquities that were seized included ancient parchment pieces written in Hebrew, Aramaic, Greek and Latin; ancient weapons; sculpture items from the Hellenistic and Roman periods; high-level murals; pottery and figurines; and many bronze, silver and gold coins,” he [police spokesman Micky Rosenfeld] said. If these artifacts are genuine (a very big if at this stage) they sound quite important. RELIGION PROF. BLOG: Canaanites Among Us. James McGrath has some sensible commentary on the recent excited reports that DNA analysis shows that the modern Lebanese are descended from the Canaanites. This isn't exactly a surprise. You may find that you have to reload the web pages to get them to work. There is a link to English abstracts of the Hebrew articles on both pages. BIBLIOGRAPHIA IRANICA: Sasanian Persia. Notice of a new book: Sauer, Eberhard. 2017. Sasanian Persia: Between Rome and the steppes of Eurasia. Edinburgh University Press. ETC BLOG: Introduction to Brill’s Textual History of the Bible (John Meade). Background on the series is here and here. Youngberg, "Identity Coherence in the Chronicler's Narrative"
NEW ARTICLE IN THE JOURNAL OF HEBREW SCRIPTURES: Identity Coherence in the Chronicler's Narrative: King Josiah as a Second David and a Second Saul (BRENDAN G. YOUNGBERG; Volume 17, Article 4 DOI:10.5508/jhs.2017.v17.a4). Among the variants in Chronicles and Samuel-Kings is the inclusion of Samuel in Josiah's narrative (2 Chr 35:18) compared to “the judges who led Israel” (2 Kgs 23:22). Samuel's appearance occurs at a major transition in the Chronicler's narrative, which links Josiah to not only David, but Saul. While there is yet to be a consensus among scholars as to why a negative death scene follows Josiah's laudable Passover, the social memory associated with Samuel adds rhetorical weight to the Chronicler's narrative.